I’ve always been fascinated by a key paradox of performance. That is that top performers are always the ones that know that they need help to achieve, and average and poor performers believe that they’ve got it figured out and don’t need help. 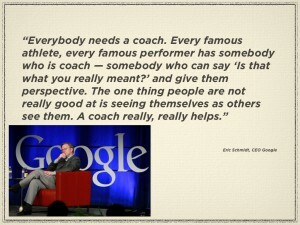 I see it everyday in the coaching we provide to salespeople and executives. The top salespeople are excited and engaged in the coaching process from the very beginning. Their attitude is, “Bring It On!” They’re open to being challenged and they soak knowledge up like a sponge. I’ve always been a fan of coaching. I’ve had a coach of one form or other (and at times, I’ve had more than one) since I was 18. I’d probably still be working for someone, making ¼ of what I’m making now if it weren’t for my coaches. Think about it. Here’s a guy worth more than $5 billion, who’s accomplished more than most can hope for. He’s an acknowledged expert and phenomenal businessperson, and he still finds coaching indispensable.